Java – I think things. The Spring framework has been the de facto standard framework to build a Java application on for some time now. Providing an IoC container and performing dependency injection was just the start. Since it’s initial release in 2002, Spring has expanded and matured, providing developers with familiar, patterns-based abstractions for common components throughout an application’s layers. As Spring grew, the configuration became more and more unwieldy and the framework became known as one that involved a fair amount of effort to set up and get going, and even the most trivial of projects came with a fair amount of boilerplate configuration. There was not an easy place to start. Maven filled this gap in the early days, pushing the community toward the concepts of convention over configuration and dependency management, and through the use of project archetypes, but the same problem eventually cropped up – repetitive, difficult-to-manage configuration. With the first release of Rails in 2005, the developer community saw what was possible in terms of a developer-friendly framework that all but eliminated the perceived shortcomings of frameworks like Spring. Frameworks like Rails came to be known as Rapid Application Development (RAD) frameworks. These frameworks shared many of the same characteristics – a well-defined convention, opinionated default configurations, scaffolding tools used to quickly create pre-configured components. In 2009, the Spring developers responded to the trend of RAD frameworks with the release of Spring Roo. Spring Roo was never billed as an attempt to replace Spring, only enhance it by eliminating the shortcomings of vanilla Spring. Spring Roo provided a well-defined convention and scaffolding tools, but was driven by AspectJ and relied on a significant amount of code generation to eliminate boilerplate code. This led to difficulty troubleshooting configuration problems, and a steeper learning curve for developers new to Java and Spring. In 2014, the Spring development team released a next-generation take on Spring named Spring Boot. Spring Boot provides many of the same RAD-like features of frameworks like Rails, and goes a step further than Roo by eliminating cumbersome XML-based configuration and the mystery of generated code. This is accomplished through the use of auto-configuration classes. Each Spring Boot module is packaged with a default configuration – the boilerplate code developers used to be responsible for creating. These auto-configuration classes provide the opinionated configuration familiar to users of other RAD frameworks, and that follows the basic best practices familiar to users of traditional Spring. In the next few sections, we’ll get a new project up and running from scratch and see auto-configuration in action. This project can be built and run, but without at least one controller we’ll have no page to display other than a default error page. Let’s create a controller and test out the app. * Created by justin on 2/15/15. 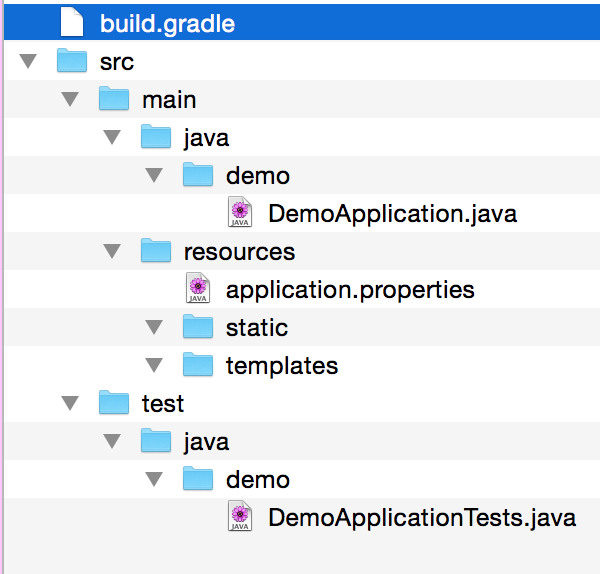 Next, start the server from the root of your project using the pre-configured Gradle script provided to us by Spring Initializr. That’s a full-fledged Spring app with a wired controller and a base configuration. Counting every line of code, that’s only 30 lines of code! You can see we’ve added a placeholder for a string named ‘message’ that we’ll supply from our controller. 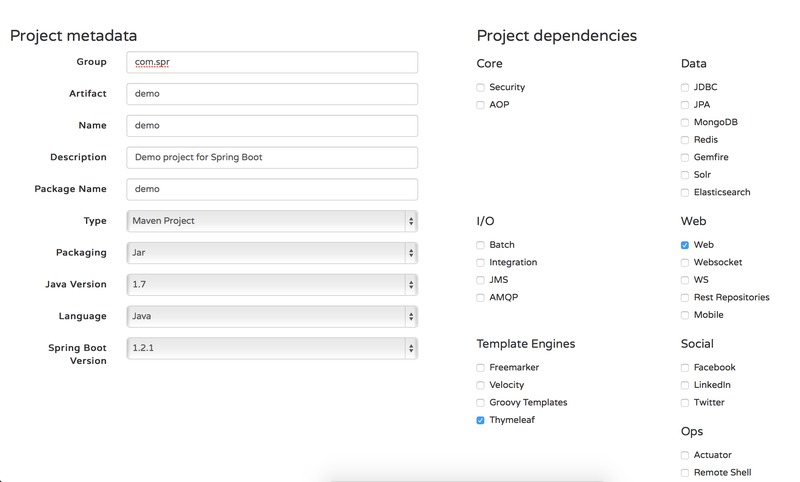 You can see we’ve created a full Spring app with a basic configuration, configured a controller, and started using a template engine to render our pages. If there is no generated code driving this, where is the configuration coming from? If we take a closer look at the console output from the server starting you can see several references to a class named ‘org.springframework.boot.autoconfigure.web.WebMvcAutoConfiguration’. This is where the magic is happening. Let’s take a look at the source on Github (https://github.com/spring-projects/spring-boot/blob/master/spring-boot-autoconfigure/src/main/java/org/springframework/boot/autoconfigure/web/WebMvcAutoConfiguration.java). Browsing through this source, we can see references to familiar bean configurations, the paths to pre-configured property file locations, the base configuration to enable Spring MVC, and much more. While the Spring Boot docs contain a lot of valuable information, several of the examples fall a bit short of what we commonly see at clients. Last year, I wrote a 5 part series that expands on the Getting Started guides provided by Spring. https://justinrodenbostel.com/2014/04/08/beyond-the-examples/. This explores some common problems that Spring easily solves: nested form binding, security integration, internationalization, and more. It has been many years since I have read this much information on Design Patterns, and in those days the language the book was based on was Java. While the concepts still apply, Design Patterns in Ruby does a great job of walking through the classic patterns. First, the way we learned them – with abstractions and interfaces – followed by iterations toward the ‘Ruby’ way. Moving between languages and development styles effectively can be difficult. It’s not just syntax, either. At the basic level, most languages function the same way. Conditionals are conditionals and loops are loops. Personally, getting into the “culture” of the language is the important part. In my opinion, culture is not just defined as the language, but also, language feature usage, development styles, etc. Switching projects and being productive on the first day is possible, but really hitting your stride takes a week or two. After the first week or two, you’re remembering the syntax better, you’re remembering and using language features appropriately, etc. That is the thing I think I’ll like about this book more than anything else. This book does a good job of spelling out the cultural differences between a language like Java and a language like Ruby; how to get your brain from thinking in Java to thinking in Ruby. The original GoF book on patterns for Java was a set of recipes that solve common problems – in this case, we get the same, along with the transition between the two, as well as patterns that can be uniquely addressed using Ruby. A quick refresher with a book like this before my next Ruby project will be in order.